Forensics officers work near the car that crashed into security barriers outside the Houses of Parliament in London on Tuesday. British media report that Salih Khater has been arrested on charges of terrorism. Forensics officers work near the car that crashed into security barriers outside the Houses of Parliament in London on Tuesday. British media reports Salih Khater has been arrested for the crash on charges of terrorism. A 29-year-old Sudan-born U.K. citizen is being held on terrorism charges relating to a car crash at Parliament in London that injured three people, British media report. 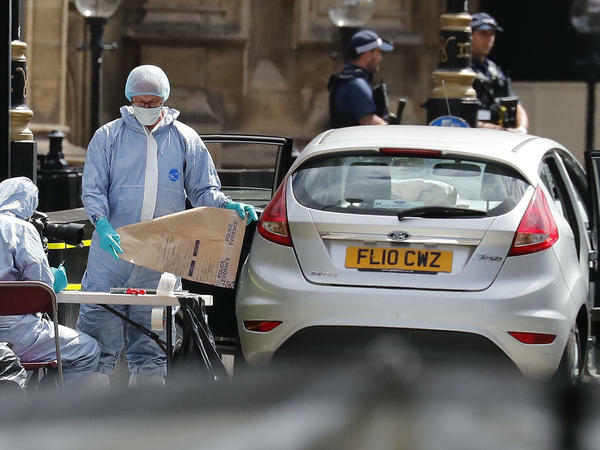 On Tuesday morning, a Ford Fiesta drove through pedestrians and cyclists before crashing into security barriers outside the Houses of Parliament. A suspect identified as Salih Khater was detained. The BBC reports Khater is "believed to have lived in a first-floor flat in the Sparkbrook area of Birmingham until four months ago, when he moved to the city's Highgate area." He studied accounting at Coventry University from September 2017 to May of this year and is no longer enrolled, according to the BBC. Khater was alone and unarmed when he was arrested by officers at the scene. He was taken to a south London police station for questioning, where he remains in custody. Authorities say detectives have established that the privately owned Fiesta traveled from Birmingham to London on Monday night, and they're investigating two addresses in Birmingham and one in Nottingham. Metropolitan Police say there's no evidence that Londoners are in any further danger in connection with the event. "The priority for the investigation team is to understand the full circumstances and motivation behind this incident," Scotland Yard said in a statement. Three ambulance crews responded to the Westminster crash on Tuesday. Two people, a man and a woman, were treated at the scene and taken to the hospital. A third person with minor injuries "was assessed at the scene," according to the London Ambulance Service. The two patients were released from the hospital about 12 hours after being admitted. It was the third vehicle attack in London since last year. In March 2017, a radical Islamist drove across Westminster Bridge, hitting pedestrians. Roads around the Houses of Parliament may be permanently closed to avoid another attack, according to The Times of London. "Parliamentary authorities are preparing to look at the options for improving security around the building," The Times reports. "One proposal to be put before MPs would be to ban all traffic from one side of Parliament Square, allowing for the removal of some of the black steel barriers that are designed to prevent attacks."